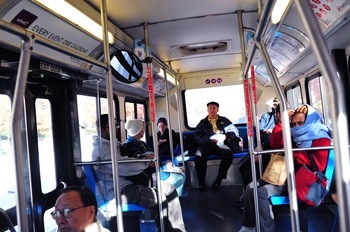 Posted on Fri, Jan 27, 2012 : 12:49 p.m.
A meeting scheduled for today on the countywide expansion of public transit services — which would have targeted financial recommendations — has been cancelled. Mary Stasiak, spokeswoman for the Ann Arbor Transportation Authority, said the planned meeting of the AATA's countywide financial task force has been postponed due to task force members' concerns about having enough time to digest the large volume of information being provided by a sub-group that's making financial recommendations. "The issue of transit funding is too important to make decisions without the benefit of a careful review of the sub-group's work," Stasiak said, adding the meeting will be rescheduled. AATA officials were planning to brief media representatives and review the sub-group recommendations prior to the full task force meeting. The AATA is looking to expand transit services throughout Washtenaw County, but recommendations on how to pay for that have yet to be finalized. Many members of the community, including members of the Ann Arbor City Council, have been anxiously waiting to hear the recommendations for how a countywide expansion of the AATA will be financed. AnnArbor.com requested a copy of the sub-group's recommendations today but was told by Stasiak they haven't been finalized yet. "That was expected to occur at the meeting today," she said. The AATA countywide push comes at the same time big talks are happening at the state level around expanding public transit services throughout Southeast Michigan and increasing funding for roads and bridges in Michigan by $1.4 billion annually. State Rep. Rick Olson, R-York Township, said the package of transportation bills in the House range in number from 5298 through 5314 and other bills have been introduced in the Senate. According to Lansing news agency MIRS, there are 30 bills in all that cover a vehicle registration fee hike, a gas tax at the wholesale level that equates to about a 9-cent increase, a regional transit authority for Southeast Michigan and a new commercial corridor fund. Thirteen bills in the House have an identical companion in the Senate. The final four House bills do not, but it's expected that more bills are coming. The gas tax increase is spelled out in HB 5298 and SB 918, while an increase in vehicle registration fees is found in HB 5300 and SB 919. The bill calling for creation of the commercial corridor fund is HB 5303 and the regional transit authority legislation is HB 5309 and SB 909. Other proposals in the package include letting counties vote to raise vehicle registration fees locally and putting that revenue toward local road repairs (SB 910) and creating an optional county registration fee to benefit public transit (HB 5312 and SB 0910). There also are proposals allowing dedication of a lane for public transit in state rights-of-way on state roads and modifying conditions to receive funds from the state transportation fund. Gov. Rick Snyder has made it clear he wants transportation to be a top priority on the state's legislative agenda in 2012 and bipartisan support is building around his ideas. Sat, Jan 28, 2012 : 1:34 a.m.
Clearly it is time for AATA to take a breather and consider how moving events affect the ambitious Transit Master Plan and the creation of a new authority. One thing that has not been adequately addressed is the question of how much of the rest of the county will actually participate. My latest post <a href="http://localannarbor.wordpress.com/2012/01/27/how-much-county-in-washtenaw-county-wide-transit/" rel='nofollow'>http://localannarbor.wordpress.com/2012/01/27/how-much-county-in-washtenaw-county-wide-transit/</a> looks at different scenarios and considers consequences. In researching this post, I discovered that none of the Act 7 Interlocal Agreements that are supposed to be the basis of the U196 board have actually been filed, and apparently 3 of them (out of 5) had not been completed, at least as of this morning. Fri, Jan 27, 2012 : 10:43 p.m.
Fri, Jan 27, 2012 : 10:01 p.m.
&quot;The issue of transit funding is too important to make decisions without the benefit of a careful review...&quot; Exactly! It is far too important and far too complex of an issue for the Cities of Ann Arbor and Ypsilanti to dive in to without future funding and other issues being crystal clear. Now that AATA agrees with the responsible members of City Council on the need to proceed deliberately, hopefully both city councils will table the 4-Party Agreement indefinitely. There is a host of new State transit legislation coming forward that could change the playing field dramatically and there's no reason to rush into it. Is this a surprise? There is no way to fund this stinker in any practical form. No one appears to want this outside of Ann Arbor and Ypsilanti. Fri, Jan 27, 2012 : 9:32 p.m. The financial task force needs to look seriously at the future level of state financing available to the AATA. If the new regional transit authority takes charge of state spending in the area, there may not be as much money to go around, especially with the buildout needs of the new regional bus lines. Fri, Jan 27, 2012 : 7:53 p.m.
Ann Arbor residents already pay 2 mills to finance AATA and I'm not willing to pay more. I favor keeping it an AA-YPSI system until others agree to pay. Fri, Jan 27, 2012 : 6:53 p.m. This is all a complete waste of time unless the City of Ann Arbor &quot;ELITES&quot; want to pay the entire bill. Fri, Jan 27, 2012 : 7:14 p.m.
You have said this before (or someone else has), but I don't quite understand your comment. Are you saying no one outside AA will want to pay for it? Are you speaking of voters or city/township councils? Fri, Jan 27, 2012 : 6:45 p.m.
We need some wealth re-distribution around here....... Let's have Ann Arbor residents pay more for the &quot;county wide&quot; plan than the poor folks in Manchester, Chelsea, Saline, and York Township. It's about time.